Federation for Internet Alerts (FIA), the nonprofit whose mission is to get crucial alerts in front of the right people at the right time and place, recently received multiple Creative Media Awards for its life-saving technology. It’s also the second consecutive year that FIA has won the Shorty Social Good Award for Technology. And this is just the start. FIA recently participated in the 2017 re:Invent Nonprofit Hackathon. Through a collaboration with Nitor, the organization built a full-stack solution enabling the International Centre for Missing and Exploited Children to issue automated, life-saving alerts for missing children in 23 countries using artificial intelligence. We reached out to FIA’s CEO, Jason Bier, to uncover the nonprofit’s keys to success. Read about Bier’s take, and one father’s life-altering story of how FIA’s alerts saved him and his family from a deadly tornado. What do these awards mean to your organization? As FIA leverages the Internet to improve the scale and reliability of emergency alerting, I see these awards helping our cause in a few different ways. FIA accepts the OMMA award for Best Use of Artificial Intelligence. Pictured from left to right: Mickey Schwab, FIA CTO, Ben John, CTO of AppNexus, Jason Bier, FIA CEO, Lizzy Hanna, VP at Engine Media, and Eric Wheeler, CEO of 33Across. First, it helps us inspire our volunteers. This is important because we don’t have a lot of money. We’re not here to fund things. We’re here to create things. The idea of recognition — receiving an award — is important because our volunteers feel like they’re doing something good and our mission is being accomplished through technology grants with multiple FIA Partners. The awards also demonstrate our capabilities to people in countries outside of the U.S. and can spark new channels of international opportunity. Last year, we expanded into Canada through our data partnership with Environment Canada. We combined postal codes with digital capabilities to disseminate real-time, automated alerts for pressing weather events in Canada. It also means a chance to hone our Alexa skills and to expand our development of public safety opportunities. We were fortunate to be a part of the Hackathon at re:Invent, where two participating engineers followed up to say they wanted to work with us. This says a lot about what AWS is doing to help connect organizations like ours to new relationships and technologies, which ultimately helps drive innovation. And lastly, collaboration opens doors for licensing. We see opportunity in private-public partnerships to improve how law enforcement uses technology for public safety. Applications for alerts can be one of the biggest opportunities for technology to save lives. Scaling through AWS in dozens of data centers gives us the opportunity to exponentially help many more people using the same technology. 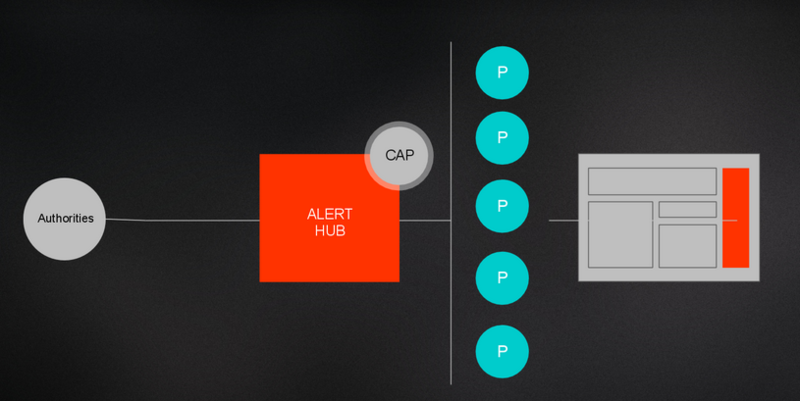 Our alerts circle the globe in 200 milliseconds thanks to our use of Common Alerting Protocol (CAP), which takes notifications from international authorities — from Taiwan to Tanzania — and centralizes the data in our Alert Hub platform. It then gets sent to publishers and reaches the public instantly. We also use interactive AWS solutions, including Amazon Alexa, Amazon Echo, Amazon Echo Show, Amazon Echo Dot, and Amazon Rekognition. We bring data into the cloud to make it available across data centers around the world. What is FIA’s secret sauce? Other than lots of caffeine? One of our key differentiators is automation. We use AI, ML, and have the ability to ingest data and turn alerts on and off in geo-targeted areas based on information from the alerting authority. Whether it’s a child abduction or a weather alert, we put this content into templates that are used to display that particular event around the world. The system runs 24/7 without human intervention. Our mission has another important aspect. We’re here to help alerting authorities save lives by using alerts in innovative ways. Technology nonprofits have not had a place in society to develop and deploy innovation. Many exist exclusively to collect donations and grant funds to organizations in need. Few are solely driven like we are to collaborate on technology and develop solutions to help save lives. Our holistic mission has pushed other companies to do more through collaboration, and we have direct competitors joining forces to help save lives. This developed when FIA started scaling; companies noticed the opportunity to get involved and jumped on the chance to help people. Tell us more about how FIA plans to interact with future technologies. A good example is our work with Digital Signage Federation (DSF). They support companies that have the software and hardware to create digital signs for restaurants, billboards such as what you see in New York’s Times Square, and more. DSF approached us in 2017 to say they liked our work and wanted to help. We’re now launching initiatives with DSF and its member companies to distribute alerts on a grand scale, nationally. Our first project is with the NYC Transit Authority for weather emergencies and AMBER alerts. Traditional media channels are relatively crude, blunt instrument. At FIA, we’re using what advertisers leverage in the new digital marketplace to reach consumers. We’re adding nuances with creative colors and text to distribute life-saving messages with continuity across screens, so that they appear as real and believable as possible. It’s the ability to blend creativity with data, time, and urgency – and it hasn’t ever been done before. Given the reliance on your alerts by billions of people, what scares you the most? My biggest fear is that we don’t get as far along as we could get, as quickly as we need to, and it causes people to lose lives that could have otherwise been saved. We know it’s looming, and I wake up each morning to find out what we can do to prevent that from happening. Through history, weather has been a great unifier. No one wants someone to die in a typhoon no matter what country you’re in. FIA is there to seize this opportunity as a nonprofit. We believe we can unify the private and public sectors, NGOs, and our volunteers to create change, and give everyone the equal right to receive alerts – whether in the richest or poorest country. 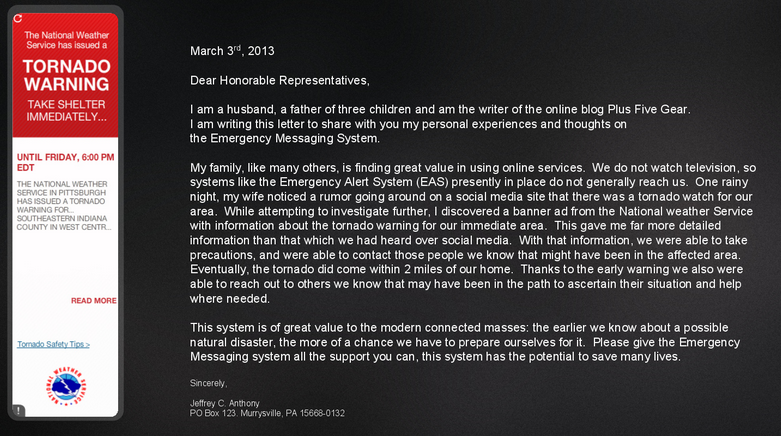 Jeffrey Anthony’s story: In March of 2013, Jeffrey was at home feeding his newborn baby when he received an alert from FIA’s Alert Hub of an imminent tornado. He credits FIA for saving his life, and the lives of his family and others in the storm’s deadly path. His letter to the U.S. Congress (below) highlights the importance of FIA’s work. Also pictured (bottom left): The original alert Jeffrey received from FIA.